On special occasions here at Appellation Mountain, we celebrate by giving one lucky reader a week – an entire week! – to choose the content. Kara was the lucky winner this time around, and I’ve loved the names she’s chosen – Javier, Roxelana, Asenath, and Maureen. Her challenge for Friday was a tremendous one: write about Native American names. And why not? Couples who honeymoon in Paris return to name their daughter Genevieve, and a parent whose great-great-grandmother came from Italy in the late 1800s might decide to name his sons Luca and Matteo in homage. American English is eclectic, and our naming conventions reflect that. We borrow, and we discover and invent, too. I’m always intrigued by the proces of reclaiming. Oppressed peoples often struggle to hold on to their language and culture. Generations later, as their descendants attempt to reclaim that heritage, finding authentic names can be elusive, especially when their ties to the culture are several generations removed. What does this have to do with Native American names? There are over 500 federal- and state-recognized tribes, and there may be more – I’ve read estimates of over 200 additional groups that do not appear on any official lists. They were here first, and they were everywhere first – there’s not a part of the United States that does not have a tie to an indigenous culture. We can see it in place names, in rivers and towns, and sometimes it isn’t clear if a name is European in origin, or indigenous – and some names, like Sonora and Tallulah might have roots in both. And many of us have heard that our great-grandmother was half Cherokee, or maybe our grandfather talked about having Powhatan cousins. But what about personal names? We can all rattle off famous Native Americans: Hiawatha, Black Elk, Geronimo, Kateri Tekawitha, Pocahontas, Sacajawea. But few of those names have filtered into regular American English use as given names for our children. 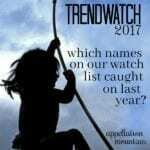 Tribal names have been popular. Cheyenne was a Top 100 name for girls in the 1990s, and Dakota charted for both genders, also reaching the boys’ Top 100 at the same time Cheyenne was most in vogue. Tia Mowry named her son Cree. Some contend that this is offensive to native peoples, but just like the problematic Cohen, that hasn’t stopped parents from bestowing the names on their children. Spanish seems to be different. Names like Nayeli, Millaray, Nahuel, Citlali and more all have roots in indigenous languages, and have become mainstream in Spanish. This means that many of them are heard in the US, too. Can English-speaking American parents do the same? 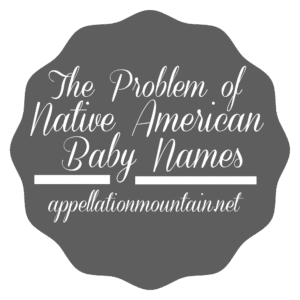 I initially hoped to compile a list of bona fide Native American baby names that felt like suitable crossovers – but when I tried to verify the legitimacy of many of the names, it was clear that wasn’t so easy. So instead, here are some approaches that might feel comfortable for parents with an interest in Native American baby names – without insulting the cultures we intend to honor. First, a warning: the number of less-than-authentic lists of Native American baby names is startling. But, oh the names! If Adsila was really a name meaning blossom, wouldn’t it be perfect? Or make that two warnings: traditional names related to the circumstances of a child’s birth. While customs vary, it appears that they were not normally chosen by the child’s parent in private. Today, these stories are unusual – the child born in the blizzard who receives the middle name Snow can earn a spot on the local news. But for some cultures, the equivalent of Snow as a given name was the norm. This helps explain why a list is so elusive. When a name is the outcome of deliberate choice among many possible options, then there’s a need for lists. If a name is determined by outside events, then there’s no point in creating a list. It also seems to be true that many indigenous peoples went to great lengths to separate their traditional names and official record. A mainstream name went on the child’s birth certificate, but a tribal name was in everyday use. In some ways, this is reminiscent of immigrant families using Mary for their daughter’s legal name, but reverting to Maria at home. In other ways, it reminds us of a very ugly history of oppression and maltreatment. If you do have Native American heritage, chances are that you are aware of other possibilities – family names, names traditional to your specific tribe, naming customs that could inform choosing a name. If you are aware of your heritage, but don’t know anyone fluent in the language, there are a tremendous number of resources, like this one, available to fill in the blanks. Now, on to some possible approaches to choosing a Native American baby name. Choose an English-language noun name consistent with Native American customs: Noun names borrowed from nature are popular, and many would have been familiar in Native American culture. In Choctaw, Nita means bear, and in 2014, Bear is a reasonable name for a child. Not every nature name would have been used by every culture, and you’ll need to add your own layers of meaning. Tecumesh’s name translates to “panther across the sky,” but it would inaccurate to say that his name means panther. Instead, legend has it that Tecumesh was born just a few days after a meteorite streaked across the sky. In Shawnee culture, this was interpreted as the spirit of the panther. While the limitations remain, there are no shortage of possibilities in this category: Fox, Wolf, Willow, Leaf, and plenty of botanical names, or even pan-botanical choices work. Choose the Native American version of a European name: This might feel unsatisfying, and yet, it is consistent with how some Native Americans have assimilated into mainstream culture. Saint Kateri Tekawitha almost certainly had another name in her native Mohawk language, but we know her by the Mohawk form of Catherine. It’s also consistent with how many of us choose to honor European heritage. There are kids who are one-quarter Irish answering to kelly green choices like Maeve and Ronan, but it is just as common to choose Liam instead of William, Caitlin instead of Catherine. And in some cases, like Hawaiian names, these have one foot in both cultures: Malia is a cousin to Mary, but also related to a native name meaning calm. The only stumbling block here is that I can’t find a reliable list of possible equivalents. They would vary from language to language, and some of the origins would be French, rather than English – so Stephen becomes Etienne becomes Atian in Abenaki. Challenges remain, but it is a path worth considering – especially because Atian is more accessible than authentic choices, like Ahtahkakoop. Choose from the very small list of Native American names that are verified: A few names are unambiguous, and an even smaller number of those names are now mainstream. Perhaps the most popular of the crossover names is Winona. Legend tells us that she leapt to her death rather than marry a man she did not love. Winona was the daughter of a Sioux Dakota chief, and her name was more of a nickname given to any firstborn daughter. Now it is a reasonable choice for a child, popularized by the legend, as well as actress Winona Ryder. There’s also Liseli, the name usually associated with the Zuni girl in a traditional, Cinderella-like tale. Except I’m tempted to read Liseli as a Zuni form of Isabella or Elizabeth – meaning that she really belongs in the previous category. A few others include: Isi, a Choctaw name meaning deer; Sequoia, from the inventor of the Cherokee alphabet – though he answered to George for business purposes; Sacheen, possibly meaning little bear, from a 1960s-era Native American activist; Metea, a nineteenth century chief of the Potawatomi in Indiana. Choose a Native American language, and find a noun name from that language: This suggestion came directly from this site, and it might be the best option available for English-speaking parents with minimal knowledge about their roots. While lists of given names are elusive, dictionaries are widely available for most languages. Finding a noun with a suitable meaning, one that will work when pronounced in English, seems like an interesting path to a meaningful name. If authenticity is important, you might want to seek out a native speaker. Have you mangled the word when it is pronounced in English? Or changed the meaning entirely? But if you’re looking for something inspired by Native American culture, starting with the dictionary seems a reasonable approach. Would you ever consider using a Native American name? 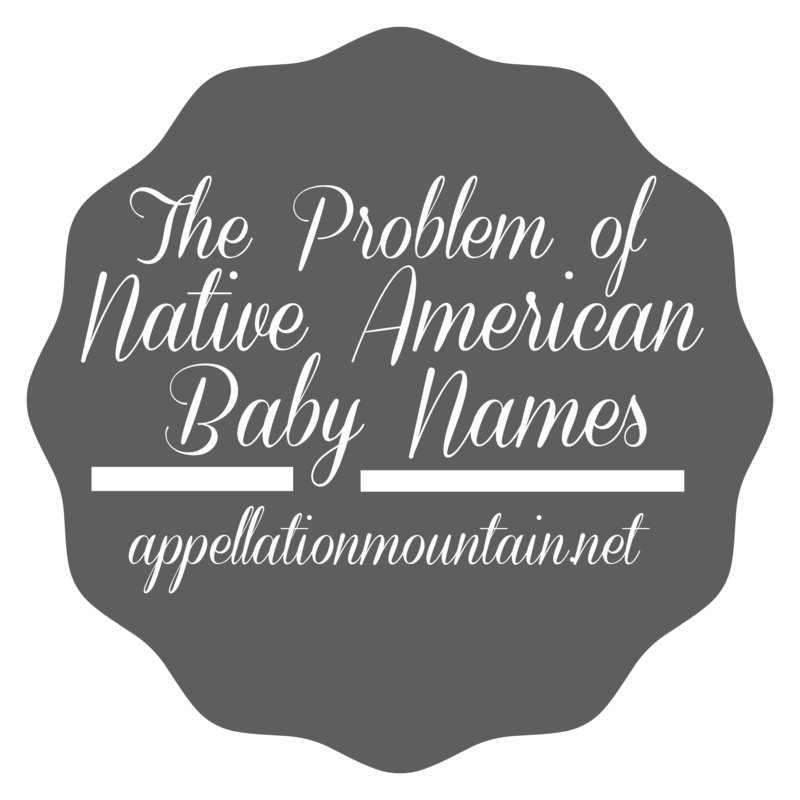 What do you think of the difficulties of choosing Native American names? Name Help: Should we name our daughter Sochi? I actually know of a little boy named Cherokee. Personally I think people that are offended by names are too sensitive. I’ve even spotted a baby Lucifer recently, sometimes the way it sounds beats the meaning behind it I suppose. What about Seattle? It’s probably the only Native American name that is in my personal top ten. My husband’s step-dad is Ojibwe. He and his sibling have very generic first names: Ethel, Sandra, John, Francis & Arnold … but FIL’s nickname Buck comes from his Ojibwe middle name which means something along the line of “when deer shed their antlers.” We considered naming our son either Roe or Hart in his honor. Thanks for another great post, Abby, and thank you for handling the issue with respect and sensitivity. My partner is indigenous from South America (Aymara) so there are similar sets of issues there with using names from native languages, and the legacy of Spanish colonialism, where many people who have indigenous heritage have Spanish heritage names. Thank you for opening up resources for parents who might wish to honor their Native heritage. My husband is Native, so this is an issue we take to heart. We do find it very offensive when the names of tribes are used as personal or pet names with absolutely no forethought or connection to the people. I’m more lenient with word-names in any language/culture, as long as they’re not considered sacred. Our personal choice is that our children would have legal names that are separate from their religious/cultural names. A very good point about nouns that are potentially sacred … I think that’s always one of the pitfalls of borrowing names without a good feel for the cultural context. Great post! I have to put in my two cents since I live in Oklahoma. Several Native American children here have English nouns for names. I’ve seen names like: Pretty Sky (my favorite), Grey Hawk, Red Hawk, Bear, etc. as given names. I think those work well. Some kids also have actual Cherokee names, but I find this problematic as the letter “v” in Cherokee can make a long “a” sound, leaving those of us who don’t know the language (which is the majority) with pronunciation confusion. Also, Cherokee has its own syllabary, so traditional Cherokee names on birth certificates and documents must be spelled using the English alphabet. That could be why the “v” makes an entirely different sound when it’s spelled using the English alphabet. Anyway…many non-Native children here have names like Dakota, Cheyenne, and numerous variations of these Native American-inspired names. 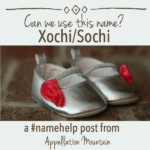 Overall, I’d stick to the names that have been mainstreamed or nature names that have a Native American vibe because traditional names with the traditional spelling will cause so many issues for the child (at least in Cherokee–other tribal languages might be easier). Also, I’d advise not naming your child after a tribe. I’ve seen a few girls who were named “Cherokee” who did not look Cherokee at all, and my husband (who is Cherokee) thought it was in poor taste. However, I have seen a few elderly women who were Cherokee with the name. So…there’s that. The custom with my husband’s family is that the elders (his parents) give each child in the family a name when they are born. My sons’ Cherokee names are the words for “seed” and “fog” (I have to go here http://www.cherokee.org/AboutTheNation/Language/Dikaneisdi%28WordList%29.aspx each time I want to remember how to pronounce them. lol) and my daughter’s name is “just a Cherokee name” that sounds to me like “shoe-shawn” (I have no idea how to spell it and am really not a fan of it. I’m wondering if it’s a variation of Susan???) And finally, they chose the Cherokee words for “hope” and “faith” for my twin daughters. Anyway, if you can’t find a native Cherokee speaker, the link above is a good place to start for nouns, but there are also dialects within the language, and I’ve heard people pronounce the same word in very different ways. So…again, it might be best to stick with mainstreamed names or ones with a Native “feel” to them. Anyway, that’s just my opinion. I enjoyed this post! Thanks very much! And I’m fascinated by the custom of the grandparents providing a traditional name … such a powerful way to link across generations, isn’t it? Interesting about the older women named Cherokee … I suspect that sensitivities have changed. Cheyenne, Dakota, Cherokee … a handful of tribe names surface earlier in the twentieth century. Your explanation, that they were sometimes given to children with some native heritage, seems plausible. This may sound trivial, but just because someone doesn’t “look” like an expected ethnicity, doesn’t mean they aren’t. Growing up, I had many Native American friends… most had blond or light brown curly hair, freckles, and were light-skinned. One of my adopted sons is a registered tribal member, and he certainly doesn’t fit the stereotypical appearance. It is just a little thing. We all get our looks from scattered ancestry, but they don’t always reflect our direct heritage. Lovely post, Abby! Super thoughtful. An excellent point, The Mrs. – well said! I just wanted to comment on the link you made to Irish names because it confused me a bit and I’m not sure the distinction is clear between what is Irish (as in an Irish language name) and what comes from an Irish name but is newer and maybe Irish in origin but not Irish language / Gaelic. Maeve is not Irish Gaelic; it is an anglicisation of the Irish name Méabh, also spelled Méadhbh. Also Ronan, again, is very directly from an Irish name but ithe name spelled in Irish is Rónán. Liam, on the other hand, is Irish Gaelic, while William would be considered the English of this (there is no letter W in the Irish language!) and Caitlín is the Irish language equivalent of Kathleen rather than Catherine (pronounced Catch-leen because of the í, but now often Kate-lin) while the Irish for Catherine is Caitríona. Phew! I don’t mean to offend by adding my two cents; I just thought the detail might be of interest. Being a speaker and a teacher of Irish, I love to see Irish names get a mention! Great guide, Abby, and I appreciate the difficulties involved in writing it. I remember when I wrote about Australian Indigenous names, I felt extremely worried that it might be considered insulting. However, the more Indigenous people I spoke to, or read their books/articles, the more I was told that using the vocabularies of Australian Aboriginal language for names was a wonderful way to keep these languages alive, at least on some level. It can be a gift to that culture, not just taking from it. Very well said, Anna – thank you! I do love spotting Aboriginal names in your birth announcement posts – do you think they’re mostly from families with Aboriginal heritage?